• Have virtually anytime, anywhere access to your business desktop, including e-mail, files, business applications, and more. • Share resources and equipment, such as Internet access, printers, and fax machines, to get the most value from your technology investments. • Enjoy compatibility and scalability. 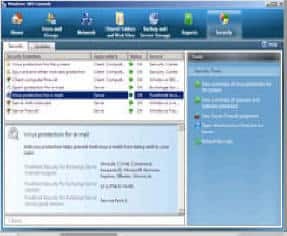 As your business needs change, Windows Small Business Server 2008 can change with you—easily add users, servers, and applications, or expand into other Microsoft technologies. • Work more efficiently and add more value to your business with an integrated administrative console. • Work confidently with a top performing network based on Windows Server 2008 technologies. • Use antivirus and anti-spam protection to help protect your information from malicious attacks, viruses, and spam. • Keep your computers and servers current and your network healthy and up to date with the latest updates. • Get better control over your business and business information with daily and weekly reports alerting you on the health and security of your technology. 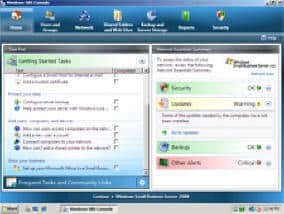 A single administrative console gives you or your IT consultant a daily view of PCs and servers and makes it easier to manage common IT tasks. • Get an at-a-glance snapshot of the security and health of your PCs and servers from a ‘green check’ report. • Improve your day-to-day efficiency by using a central repository for storing and sharing information. • Connect with customers, vendors, and suppliers easily and professionally, with access to contacts, appointments, and files from any Internet-connected computer or a Windows Mobile–powered smartphone, so you can be responsive even when you are away from the office. • Create a bigger business presence with online marketing tools from Microsoft Office Live Services Small Business*, so you can differentiate your business and present a more professional image to your customers.